We made the best out of the week, regardless of the gale force winds, rain and cold. Canoe runs continued to commence, the youth run being especially enjoyable as the river was smooth and accompanied by its own personal radio in the form of Josie, Nancy, Lauren and Jamie. The Jubilee was a highlight, celebrated with a street party full of red, blue and white clothes; a delicious hog roast; enough cakes to feed Buckingham Palace; more singing – this time Disney from Jamie – and games such as tug of war and three legged races. 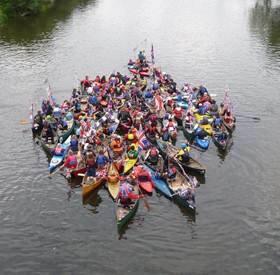 Additionally, true to the canoe club, we all convened in our boats on the river and created a diamond shape flotilla to drift down in, requiring so much organisation it could have deteriorated into a crowded paddle but it proved to be a success. Water was, unsurprisingly, the week's theme as another day was occupied by the swimming baths (warm water was a welcome change!) where we jumped to the wave machine and dived from the scarily high diving boards. This was then followed by the growing tradition of a Chinese Buffet, which every single one of us had been anticipating excitedly for the last year! We happily stuffed ourselves with third helpings of noodles and then ice-cream, all of which tasted nicer due to the subsidised price, funded by our team effort of selling raffle tickets and appreciated donations from the youth section’s now number-one fans! The moment however, which had us clutching our sides with laughter, was on the penultimate day, when our own version of the Chuckle Brothers, Matt and Ed, were heading home on their motorbikes. Matt in the lead revved his bike, knowing full well that his friend was close enough behind to be splattered from head to toe with mud. Thirty minutes later and Matt was using toilet roll to clean up the mess. Ed was not happy. Similarly, the entire youth were unhappy to be woken the next day at 6:30 by the sound of Liz’s VERY loud horn, who had been warned by my dad, acting as Steward. All the rain had caused the nearby river to overflow and the camp was in danger of flooding. The next couple of hours were a frenzy of packing as we raced to beat the mighty torrent of rapid flowing water, usually at five feet but insanely increased to fourteen feet! It was a dramatic end to the week and an excuse to be bought cooked breakfast at ASDA. Again thanks to the organisers, the youth leaders – good luck Rich in your RAF career! – and Helen Beeston who gave us hours of fun in a complex treasure hunt.